Yes yes it's Masters week and the years first Major starts this Thursday. For those of us that can't make the big event we can sit at home and watch the various dramas unfold at Augusta and cheer on our favorite players with some Masters swag. This year I'll be donning my new Masters Polo from ArnieWear a limited edition inspired polo shirt features a distinctive green and yellow color theme. How can you not love a golf shirt that celebrates the 50th anniversary of Arnold Palmer's second Masters crown. Love the contrast piping on back with Signature Arnold Palmer embroidery on the back representing a direct replica from his time.I can only hope it helps my game with some Arnie juju. Asher Golf also has a cool Masters Tee definitely a must have for the driving range. It's available for a limited time or while supplies last so don't wait. I've ordered my XL. 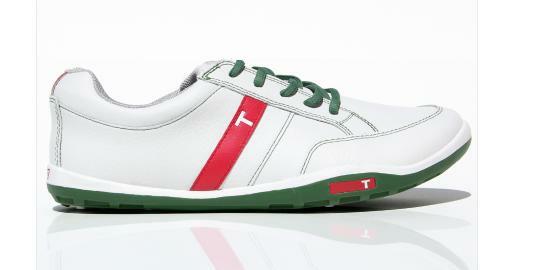 TRUE linkswear is offering the TRUE phx White/Green Limited Edition shoe for $99.99. A definite homage to the years first Major. This is the first white phx that TRUE has offered with pebbled leather. Looks great with the green sole and laces Only 250 pairs have been made so be quick and order. What will you be wearing for Masters Week?